Report: Norway Looking For Possible Kenyan Mall Attacker : The Two-Way The family of a 23-year-old Somali-born Norwegian citizen who authorities are looking for say they aren't sure if he's still alive. 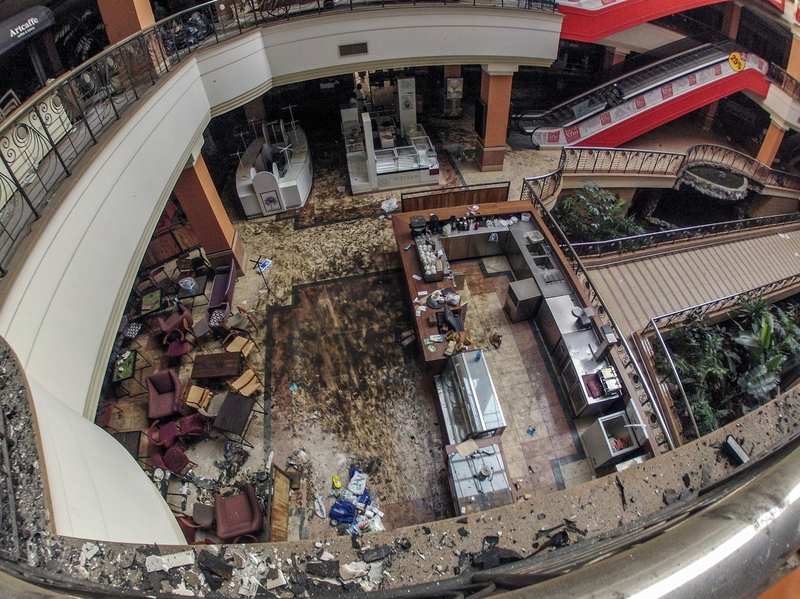 Westgate Mall in Nairobi after the deadly assault by Islamist gunmen on September 21, 2013. The New York Times reports that the investigation into last month's Kenya mall siege has led to Norway, where friends and relatives of a Somali-born Norwegian citizen are being questioned about his whereabouts. The Times identifies the man as Hassan Abdi Dhuhulow, 23. Authorities, the newspaper says, are trying to determine if Dhuhulow was one of four militants caught on a security video at the Westgate shopping complex in Nairobi during an attack that began on Sept. 21 and lasted four days. At least 67 people were killed in the seige by suspected al-Shabab gunmen. "His sister, who spoke on the condition of anonymity, said in an interview here in Larvik [Norway], where Mr. Dhuhulow grew up, that officers from the Norwegian security police had asked her whether her brother had placed calls from Nairobi, including from the Westgate shopping mall, during the siege. She said that he had not and that the family was unaware of any role he might have played in the attack. A spokesman for the Norwegian Police Security Service, Martin Bernsen, said investigators were also unsure whether Mr. Dhuhulow was still alive. Several explosions and a fire at the mall have made it hard to distinguish between the remains of the victims and attackers. The authorities have been unable thus far to identify any of the militants among the bodies pulled from the rubble." Meanwhile, the BBC reports that two charred bodies pulled from the wreckage of the Westgae mall are "highly likely" to be of two of the assailants. The BBC quotes Ndung'u Gethenji, chairman of the Kenyan committee investigating the attack, as saying AK47 rifles were found next to the bodies and that "the army does not use AK47s." Gethenji told the BBC that the bodies would undergo forensic tests in coming days. It's not clear exactly how many attackers there were or whether any of them survived and escaped after the siege.